Link to Paste. Gengar has always been a very popular and effective Mega Evolution since its debut in 2014. It's very fast base 130 Speed and 170 Special Attack stats means it can hit first and hit hard, but the main appeal of Mega Gengar is its Shadow Tag ability, which is very helpful to prevent your opponent from switching to exert a lot of pressure. Gengar's Ghost and Poison typing are especially useful in this format thanks to being able to use the Ghost-type Shadow Ball to threaten Pokémon like Mewtwo, Solgaleo, Necrozma, and Lunala while its Poison-type Sludge Bomb is great for the Tapus and mainly Xerneas. Gengar will struggle with its low bulk which means you'll be forced to play with Mega Gengar very carefully to ensure its survival. Link to Paste. Mega Gyarados's niche in this format boils down to its Water and Dark typing and how that can be surprisingly useful in this format. The Water typing can be useful to mainly deal with Primal Groudon and Incineroar while its Dark-type is great against Necrozma, Gengar, Solgaleo and Lunala. For Primal Groudon, Gyarados won't enjoy not being able to use its Water-type moves so you may see Gyarados appear on teams with Pokémon that can override Groudon's harsh sun like Rayquaza, Primal Kyogre, or even niche Cloud Nine and Air Lock users like Drampa, Altaria, and Golduck. Link to Paste. Kangaskhan has very much proven to be one of if not the best Mega Evolution in all of competitive Pokémon. Normal has always been a very safe typing in Pokémon which is great as it hits all types for neutral damage barring Steel and Rock, which resist it, and Ghost, which is immune to it. For Kangaskhan, this makes it a very balanced Mega Evolution as its Normal-type moves will hit many Pokémon for neutral damage. Kangaskhan has access to some great moves such as Fake Out and even Helping Hand and Icy Wind which have seen niche usage in the past, as well as access to some powerful offense, moves like Return, Double-Edge, Low Kick, Sucker Punch, and even Crunch to threaten Lunala. People have even experimented with Bite, which, with Parental Bond, gives a 51% chance to flinch the target. Link to Paste. Although Mega Lopunny boasts an impressive base 136 Attack stat, its history in VGC has always been as a support Pokémon due to its movepool and very fast base 135 Speed stat. Being the fastest Fake Out user in the game, Lopunny never has to worry about opposing Pokémon using Fake Out before it. Lopunny gets access to some very helpful support moves like Encore which is great to stop lock other Pokémon into an attack they don't want to be locked into and After You which is currently paired next to Geomancy Xerneas to help Xerneas setup as easy as possible. Mega Lopunny's big difference from 2016 is that its new Speed stat applies directly after Mega Evolution which helps it do its job much better. Link to Paste. Mega Lucario gained 2 things in Generation 7 that makes it viable: Meteor Mash and its Speed stat applying directly after Mega Evolution. The big appeal of Mega Lucario is its base 145 Attack stat and its Adaptability ability which means that its attacks are going to deal a lot of damage with its Steel and Fighting-type moves. Before Mega Evolving, Lucario can use its Inner Focus ability which means it has the option before Mega Evolving if your opponent has the threat of Fake Out to simply not Mega Evolve and go for damage without worrying about being flinched. Link to Paste. Manectric is another Mega Evolution that although it boasts an impressive Special Attack stat, it commonly plays a more supportive role. It has a very helpful ability before Mega Evolving in Lightning Rod, which has led players to not Mega Evolve their Manectric right away, then gains the equally useful Intimidate after Mega Evolving. Its equally impressive base 135 Special Attack and Speed stat makes Mega Manectric a very powerful Pokémon and it has access to some great moves, like Volt Switch for switch initiative and Snarl to lower your opponent's Special Attack by 1 stage, which can help deal with Xerneas, or simply use Eerie Impulse to lower opponent's Special Attack by 2 stages. Link to Paste. Mawile has also been a very powerful and popular Mega Evolution since its 2014 release and it has the potential to still find use in 2019. Its Fairy and Steel typing is especially useful against restricted Pokémon like Xerneas and Yveltal and other Mega Evolutions like Kangaskhan, who Mawile resists, and Salamence, who's weak to Play Rough. Before Mega Evolving, Mawile can use its Intimidate ability, which makes it a Pokémon that, if it's not attacking that turn and is instead just using Protect, Mawile may not need to Mega Evolve straight away and instead preserve the option of Intimidate until it decides to Mega Evolve and become an offensive powerhouse. Link to Paste. Metagross in Generation 7 was the Mega Evolution that benefited the most from its immediate speed gain upon Mega Evolving as it was the one to beat in 2018 despite not winning at the World Championships in any age division. The tools that Metagross gained in this generation can make it especially useful, mainly Stomping Tantrum, which allows it to hit Primal Groudon and Incineroar for super-effective damage. Metagross's other big attacks are Iron Head, Meteor Mash, Zen Headbutt, and Ice Punch, but the addition of Stomping Tantrum allowed Metagross to deal with the Steel and Fire-types that gave it so much trouble in the past while not worrying about Intimidate thanks to its Clear Body ability it has before Mega Evolving. Link to Paste. Mega Mewtwo Y is a Mega Evolution as well as a restricted slot that hits hard and fast but doesn't take hits very well. Its insanely high 194 Special Attack stat allows Mewtwo to deal a ton of damage and its 140 Speed stat means it will most likely move first unless up against Pheromosa. Mewtwo is commonly paired with Tapu Lele, which forms a "psychic spam" duo, focusing on dealing out powerful Psychic-type moves boosted by Psychic Terrain. Dark-types like Incineroar will feel safe until Mewtwo uses Aura Sphere and Yveltal can be threatened either by Mewtwo's Ice Beam for Tapu Lele's Moonblast. Mewtwo's biggest issue is its low bulk, which means making sure it doesn't take much damage to allow it to do its job. Link to Paste. Rayquaza, the other big restricted Pokémon who occupies both a Mega Evolution and restricted slot, is a very powerful threat. Rayquaza is another Pokémon that has a great ability before and after Mega Evolving. Before Mega Evolution, Rayquaza has the Air Lock ability, which negates the effects of weather, then it can Mega Evolve and gain Delta Stream to straight up override other weather and create the strong winds. For more information, check out DaWoblefet's mechanics video on it. Rayquaza's big strength comes from its ability but also powerful Flying-type moves with the ability to hold other items barring Z-Crystals when it mega evolves. This makes items like Focus Sash, Life Orb, and Assault Vest very popular options which works very well with Rayquaza's large enough moveset to make all 3 of these items viable. Link to Paste. Salamence, another of the game's top Mega Evolutions, has proven to be a threat in this format. Its pre-Mega Intimidate ability can make it very annoying versus Pokémon like Groudon and Incineroar, who are 2 very common physical attackers. Once it Mega Evolves, Salamence gains the Aerilate ability which turns its common Normal-type moves, Hyper Voice and Double-Edge, into Flying-type moves with a 1.2 power boost. Because Salamence primarily runs Flying-type attacks, Steel-types like Dusk Mane Necrozma before Ultra Burst, Solgaleo, Metagross, Ferrothorn, and Stakataka can typically tank hits from it very well, assuming it didn't opt for an attack like Flamethrower. For support moves, Salamence may be seen with mainly Tailwind as a speed control option, and even Roar, which makes it a very unusual answer to a Xerneas that wants to set up with Geomancy. 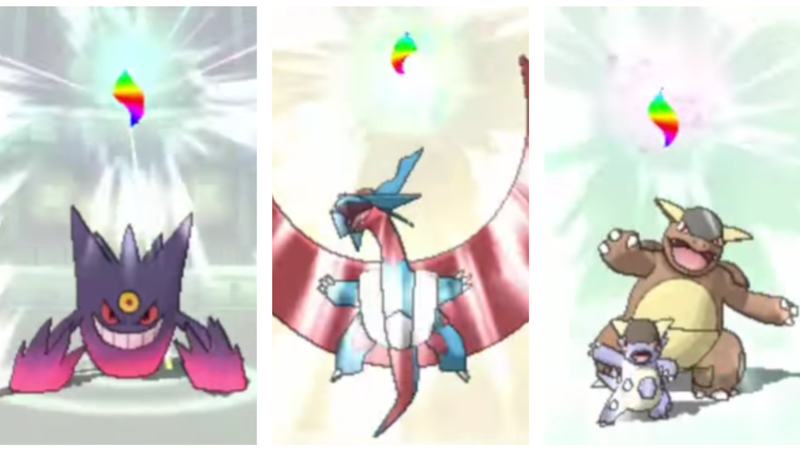 Mega Evolution is once again going to be a force to be reckoned with in Ultra Series. Picking which Mega Evolution fits your team the best depends on what your team needs from that slot and in some rare instances, your team may not even need one so finding that out and capitalizing on it is very important. This guide left out some Mega Evolutions like Beedrill, Scizor, Sceptile, and Swampert who, although have the potential to do well at major events, have something to the core of how they operate that may keep them from that level of success, such as a prior niche in VGC 2016 that no longer exists on the level it did in 2016 or a lack of offensive power or bulk to succeed. Good luck on your road to find the Mega Evolution that best suits your team trainers! Thanks for reading! Follow us on twitter @NimbasaCityPost for updates about VGC content on the website!